SILICONE MINI MUFFIN PANS BY SUNTAKE - YOUR SEARCH FOR THE PERFECT SILICONE MUFFINIS FINALLY OVER. Suntake brings you the best solution for baking: 24-cup nonstick silicone mini muffin pan. 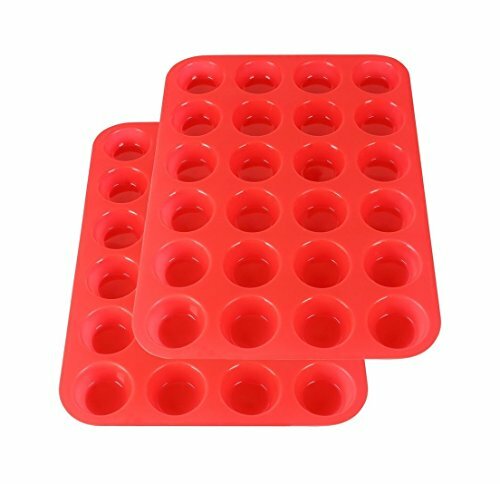 Suntake is a professional manufacturer that provides premium food grade silicone series products, include muffin pans, muffin trays, cupcake baking tray, mini muffin pan, etc. All of the products are under strictly quality control, which are BPA free and 100% safe to store food. Suntake silicone mini muffin pan is ideal for home creations. We treat our buyers as our great friends. If you have any problem regarding on our muffin baking pans and cupcake baking tray, just simply send us an email. If you don't LOVE your silicone MINI MUFFIN PAN, you can simply return your appliance and we'll happily refund every penny and listen your suggestions. NO MORE WAIT! Just press "add to Cart " to get TWO silicone MINI MUFFIN PANs and start benefiting from these premium silicone MINI MUFFIN PANs and enjoy an environmental green life with Suntake! If you have any questions about this product by Suntake, contact us by completing and submitting the form below. If you are looking for a specif part number, please include it with your message.